Before I show you the curing process, we need to talk about salt and how it turns pork belly into bacon. Curing doesn’t happen without salt. If you look back into the history of bacon, humans all over the world were packing pork belly into salt to preserve the meat. The Chinese and Europeans started curing meat as early as 1500 BC. According to the Pork Board of America, Hernando de Soto’s herd of 13 pigs sparked early conflicts with Native Americans who developed a fondness for the taste of pork. His herd eventually grew to 700 hogs, not including those that were eaten or ran away to breed and become ancestors of today’s feral hogs in the Southeast. While I don’t know the exact process de Soto’s contemporaries used to cure bacon, they had to have used salt. Today, everyone uses pink salt or Prague Powder or Curing Salt #1. Some might confuse it with Himalayan salt. Don’t do that. These are 2 different substances. 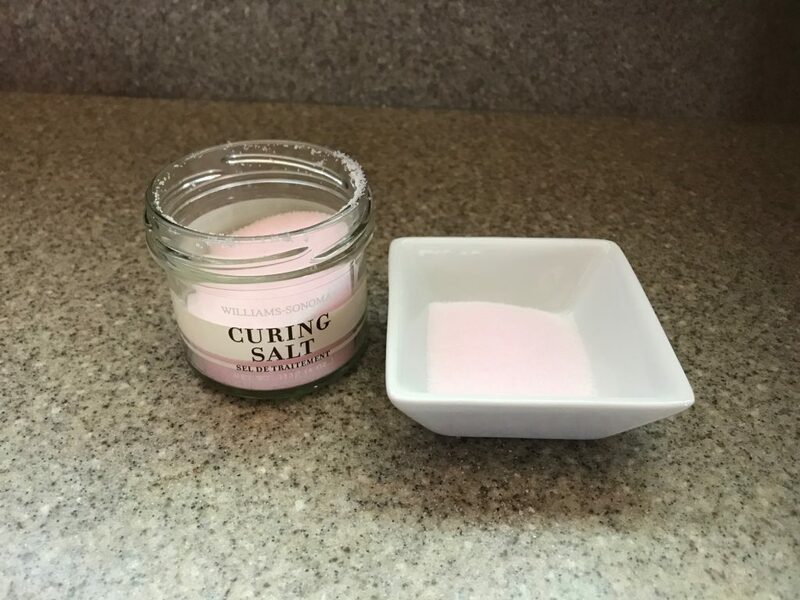 Both could be called pink salt, but only use curing salt for bacon. Most Himalayan salt comes from Pakistan which means it should really be called Pakistan salt, but that doesn’t quite have the mystery or cache of Himalayan salt. Thanks marketing team! It is purer than table salt, but it is the impurities that give it its pink color. Some people claim it has special health benefits, but I just find it tasty on baked red potatoes. Curing salt was trademarked back in 1925 as Prague Powder by Karl Max Seiffert. He turned around and sold his patent to Griffith Laboratories in 1934. Here’s the super cool thing about this…I am not from Chicago but I lived here for more than 20 years and love Chicago’s history. Griffith Laboratories was started in Chicago in the 1900s by a father and son who assumed ownership of a pharmacy. The son backed out of attending agricultural school at U of Illinois and went Northwestern to study pharmacology. Once he graduated, he and his father changed their company direction to “bring science to the food industry”. They initially focused on bread and baking, but in 1934, they bought Seiffert’s patent and began distributing it across the country. Griffith Labs still exists today as Griffith Foods and their global headquarters are in Alsip, Illinois. You can buy Prague Power directly from them OR order it off Amazon. My curing salt came from Williams Sonoma. 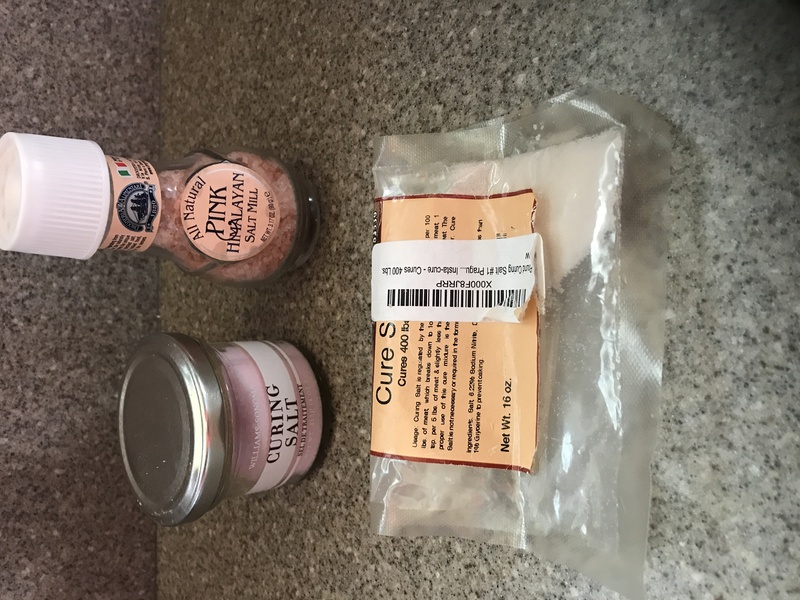 When you buy curing salt for bacon, make sure you get Curing Salt #1. 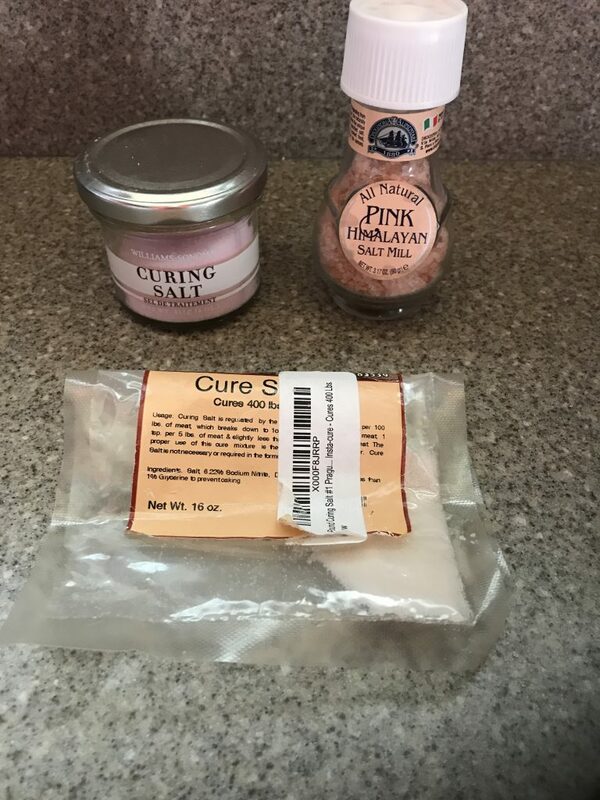 Curing Salt #2 is meant for cuts of meat that cure for longer periods of time. Think pastrami or ham. Curing salt is also known as pink salt. Manufacturers dye it this color to distinguish it from table salt. Curing salt should NOT be consumed or used like table salt. It contains 6.25% sodium nitrite which is what prevents the growth of botulism or the other icky things that grow in meat over time. We will apply this salt to the pork bellies but will rinse it off once it does its job. Do not use curing salt for any other purpose. Tired of salt? Fret not. Tomorrow’s post will be all about combining curing salt with other seasonings and getting on with the bacon process. Lots of cool pictures and much fun.